↑ Kadi, Samar (25 September 2015). "Eid al-Adha celebrated differently by Druze, Alawites". The Arab Weekly (London). http://www.thearabweekly.com/?id=2157। আহৰণ কৰা হৈছে: 1 August 2016. Muttaqi, Shahid ‘Ali. "The Sacrifice of "Eid al-Adha"". http://www.islamicconcern.com/sacrifice01.asp. Islamic, Dhul-Hijjah ‘Month. ""Eid al-Adha"". 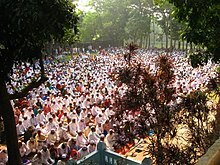 http://www.makkahcalendar.org/en/eid-al-adha/.